Why did it Happen? What does it Mean? As I begin to reflect upon and try to make sense of this whole experience, the following frequent thoughts and statements from myself, my friends and my wife come to mind. It was only stuff! Once as we were picking through the rubble, I saw the char edged page of a booklet I had brought back from a trip I had taken years ago to south Florida to help rebuild houses damaged by hurricane Andrew. The page contained a panoramic photograph of blocks of residential housing completely flattened by that terrible storm as far as the eye could see. As I stood in the midst of the devastating wreckage of my own house, my thoughts went to the remarks of one of my brothers who has been helping rebuild in the aftermath of hurricane Katrina a little more than a year ago. “For about four blocks in from the beach front there was nothing left but bare slabs, and for another six blocks in there was nothing but heaps of rubble—and it was like that for 100 miles! !” I thought of the destruction wrought by the Tsunamis in the Indian Ocean about two years ago affecting not only single communities but multiple countries. My own disaster pales in comparison to that! Not only was there mass destruction of unimaginable scale, there was also loss of life, in some cases, whole families. I had both the assurance that we would have a bed to sleep in that night at the next door neighbor’s house, and word from another that there was a nice house available for rent about 1 ½ miles up the road—all before the firemen had left the scene. One needs to keep in mind that his possessions really belong to God. God allows us to have things in order to be productive and to derive a certain amount of joy from life. My thoughts continually go back to those few seconds I had to decide which items to take with me as I fled the house. I grabbed the two most visible things, my own and Hans’ guitars sitting on the couch and an easy chair. Why did I grab his relatively low value guitar instead of the $300 digital camera I had just bought about two weeks ago resting on top of the china closet near the kitchen door, or my prized dulcimer resting on top of the TV cabinet? Hans would tell me later that he was glad that I saved this guitar because it was the one that he had learned on and the one that inspired him to reach for the level of accomplishment that he has today. This made me feel a lot better about this impromptu decision. The question of deciding to choose to save items on the basis of monetary value was irrelevant in this situation. This fire has been a dramatic demonstration of how quickly one’s possessions can be taken away. It also demonstrates that our real value is not measured in how much we have but what we are. Certainly there has to be more meaning and purpose to life than the quest to acquire and hold material possessions. I won’t even begin to try to understand why God would allow such a thing to happen to me or to anyone else. I don’t feel that my wife or me deserved such a calamity. Neither do I feel that it was God’s fault that it happened. I do feel that despite all the shock and pain, God is still there, He still cares for us, and that life will still go on. It could have been a lot worse! 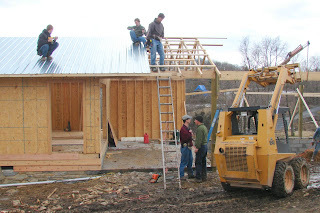 If I had followed my usual routine that morning, I would have parked the big tractor in its usual place beside the diesel fuel tank and the little Farmall Cub tractor would have been parked inside the woodshed by the feed bin. I would have most likely been a distance from the house when the fire really took off and not near enough to warn my wife. We could very easily have lost all of our tractors and all of our motor vehicles and possibly some one’s life. Is there anything we can do to help? The community response has been overwhelming! And not only have people asked if they can help, they have helped. Members of our local Old Order Mennonite community, with whom I have been swapping heirloom garden seeds for several years, have come forward with seeds to replace some of what I lost, garden tools, and a variety of home canned and frozen food. 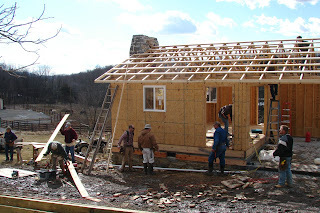 Our CSA members have offered things like a computer and telephone, a bed, and other furniture. 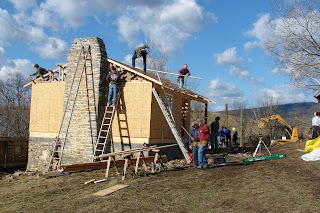 Members of our church organized a barn raising work crew to rebuild the greenhouse and to get the packing shed-pole barn I had started constructing this winter, up and under roof. The local Kurdish community is planning a gathering and meal with us. Numerous persons have given money. My wife is a deeply caring person who is constantly thinking of others and wanting to give and to help out whenever she can. Suddenly she has found herself in a position where the help is coming to her and she and I both struggle to know how to receive it. I am glad that I had spent an hour or so a week earlier running up and down the neighbor’s ice encrusted lanes with my big tractor and disc harrow in order to cut the ice up enough to remove it. I am glad for all the energy we have invested in working to cultivate friendships and community in a diversity of cultures. Now as we find our selves in need, we are grateful to find that community coming to our aid and helping to assure that we will continue to be able to keep on giving back and to keep the circle going. We have a lot to be thankful for! My wife keeps on exclaiming, “I feel so blessed!” We have a nice house to live in with lots of basement space to clean up the things we saved! We have friends! We have food and clothes! We have enough! We have hope! Thank you God! We could so easily complain that God or the Devil really did us in but in reality God has provided sufficiently. None of us were injured physically and the emotional injuries, though painful, will heal and probably leave us stronger. More than two weeks after the disaster I still feel burned and battered inside. Like the cold snow squalls that have periodically swept our area for the past week, waves of depression have repeatedly blown into my soul with their chilly fallout and I struggle to keep my head together. Many times I have felt perilously close to emotional breakdown but giving up will not help the situation. There are too many people who need us and too much work that needs to be done. Fortunately the sun comes out and the sky clears after the snow shower has ended. Emotional bruises are sort of like physical injuries such as sprained joints, deeply bruised muscles, and fractured ribs (all things I have experienced). They will heal with time and they heal best when one goes ahead with purposeful but careful activity despite the pain. Lying around and bawling over emotional pain or refusing to walk with a sprained ankle will cause it to stiffen and hurt worse. I am thankful that God is giving me the strength to work through the pain. Tomorrow I am going to plant some seeds and transplant some lettuce. We began assessing the damage and carrying a few things out of the basement by early afternoon. The firemen had gotten most of the fire out and were ready to begin the mop up. I consider it remarkable that the firemen would give me permission to enter the burned out ruins so soon. The intense fire had raced through the attic and burned its way down through the upper rooms but had not reached the basement. We immediately realized that there would some furniture and clothes that could be salvaged from there before dripping water from above would take its toll. The solid preformed concrete basement walls had never felt the heat and gave every indication that they would be sound enough to rebuild upon. My spirits lifted a little out of my state of shock when I saw some more flats of undamaged plants on the four tiered plant germinating and grow rack located just inside the sliding glass doors on the south basement wall. I added these to the dozen or so already resting safely on the other side of the yard and returned to begin dismantling the grow rack. At least there would be a few living plants to start off the new gardening season. Craig backed his pickup up to the edge of the yard as Ric, Joy, and their two children arrived and the six of us began carrying bed frames and mattresses, an antique walnut typewriter desk, and Christine’s upholstery sewing machine to the bed of his truck. The grow rack, heat mats, and florescent fixtures went to the old goat shed at the corner of the yard. There was little we could do for the remainder of the day but to stand around in shock and watch the firemen bury the site in fire retardant foam, meet briefly with our insurance adjuster, and try to answer questions. Christine and I spent much of the next morning checking out the rental house located about a mile and a half north of us, moving some essentials in, and running into town to buy some basic supplies, a new pair of insulated coveralls, rubber boots, and a few tools. On Saturday Kerwin, Phillip, and I went to town to buy a few more tools, and a new “scratch and dent” chest freezer. Sunday brought us six-eight inches of wet snow, canceled church, and an opportunity to spend some very quality time with my three children, resting and healing. Considering the stress we had been through for the past several days, only God could have provided the strength that sustained us. On Monday morning Christine’s brother James and wife Doris visited and the day was spent moving some stuff to the rental house and trying to recover some more items from the ruins including our computer. Our neighbor advised us that it might contain a salvageable hard drive. He would check it out. The following day he gave us the good news that the damaged computer worked when he plugged it in and that he was able to back up the hard drive onto his data retrieval system. We met with our insurance adjuster again on Tuesday and Wednesday to do a room by room inventory of our losses and to continue looking for salvageable items. Hans went shopping for a digital camera and to pick up a donated computer and printer. He was then able to reload the hard drive from the old computer onto the donated computer and by the following weeks end we had a computer back up and running. As we took inventory of our losses we realized that we were richer than we had thought we were. As the grim awareness of what we had lost began to soak into our consciousness we had to try to focus on what we had not lost. Considering the extent of the devastation, it amazed us what was beginning to appear as salvageable. However I could not keep from thinking of the mementos from my past that were most likely gone forever. There was the little wooden box from my long deceased grandmother Burkholder that contained among other things, a magazine article written in 1948 (the year of my birth) by my namesake. Marlin S. Burkholder. There was the high school algebra test I had passed with a grade of 104 one rare day when my neurons happened to be firing in just the right order; and the Phi Theta Kappa pin I had earned in junior college. Somewhere in the rubble there might be remnants of the bowling pin table lamp and the lathe turned footstool I had made in 9th grade industrial arts class. Various books I highly treasure came to mind—the new collegiate edition of The American Heritage Dictionary of the English Language (replaceable at a price), Heck’s Complete Encyclopedia of Illustration (most likely difficult to replace), and James Foster’s Bible Pictures and What They Tell Us, a personally autographed gift to me from a third grade teacher, published in 1897 and full of beautiful woodcut illustrations, (irreplaceable). Christine mentioned her grandmother’s china set, now shattered amongst the ashes on the living room floor, and her mother’s china, stored in the attic for her sister Darlene. The main floor was a scene of sickening destruction. 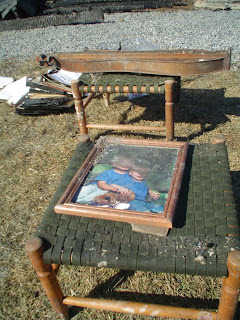 Broken and charred furniture lay everywhere. The remains of two china closets, magazines, and old phonograph records littered the floor. The solid walnut lathe turned floor lamp that Christine had bought for $3.00 at an auction, stripped and refinished, lay charred almost beyond recognition beside the remnants of my favorite leather covered Lazy Boy recliner. The walls and room partitions were still standing but ruined. In the library room an entire wall sized bookcase had toppled, spilling its charred contents into the ashes. The acrid stench of smoke permeated the air and everything we touched. Here and there stood a piece of scorched but otherwise not deeply burned furniture that appeared to be possibly salvageable. The kitchen was the least damaged. In one corner stood a smoked but otherwise not apparently damaged refrigerator. Four flashlights lying on top still worked. A house broom sitting in the eight-inch space between the wall and refrigerator showed no sign of having ever been near a fire despite the fact that directly above, the ceiling was completely burnt away. Food in the refrigerator was still cold and the icemaker was still full of unmelted ice. Much of the food and utensils in the cabinets was salvageable. The smooth top electric range, though a mess, looked like it might work again. 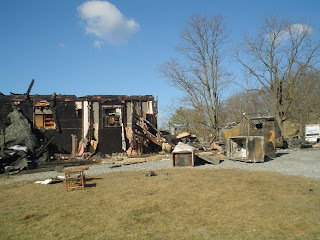 The antique buffet sitting at the end of the kitchen, though covered in wet ash, had little fire damage. 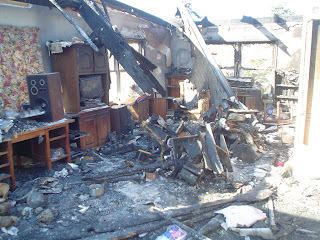 The main bedroom sustained the most damage within the house. Here were two large built in closets containing most of our clothes, a large recently built cedar closet full of woolen garments, two chest of drawers full of clothes, and our bed—plenty of food for fire. All that remained standing and recognizable was the ornate and antique chest of drawers containing my underwear and work clothes, where we would make the most amazing discovery. The chest was deeply charred and ruined. The tight fitting drawers were apparently sealed shut from melted polyurethane varnish and impossible to open. I squirreled a pry bar from the garage area and pried them open. Inside one drawer was most of my underwear. Several new packs had never been opened and the plastic was not even melted! Another contained four pairs of “Hippo sized” chore gloves and some extra heavy insulated socks I had special ordered from Gemplars for about $6.00/pair and $12.00 a pair respectively—not the kind of things one can run to town and pick up at Wal Mart. A small coin collection in the top drawer containing a large silver piece from Spain dated 1804, four buffalo nickels, and a handful of more recent 50 cent pieces was undamaged. By now I was beginning to feel that God was going to take care of some of my most basic needs. At least I was going to have clean underwear to put on tonight and I wouldn’t have to go around with cold hands and feet for the next few days. As we moved from the bedroom into the breezeway and garage area we entered into a zone of total destruction. 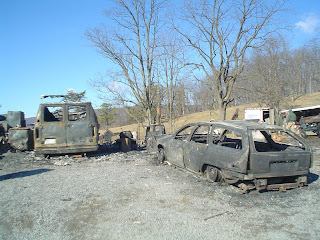 Here everything was burned to the ground. Nothing stood but the hulks of burned out refrigerators, a fuel tank, and the wood furnace. A long workbench on the back wall and all of my shop and garden tools was gone. Three chest freezers containing our stored food and my entire garden seed inventory had imploded in the intense heat and appeared as if a giant hand had crushed them, much like I would crush a soda can. Nothing remained of the market van, a car, a riding lawn mower, and my four wheeler, but sagging hulks of twisted and rusting metal. As we began digging, a few treasures reappeared. Someone had removed the drawers from the large old desk I had repaired and refinished years ago and among their contents were seed catalogs, garden records and recent purchase invoices I would need to replenish my lost seed supply and carry on my 2007 garden plans. The desk itself survived with possibly the need for another refinishing. Beside the desk I found my lathe turned footstool buried beneath a fallen slab of drywall which had protected it from serious fire and water damage. Fire and water ruined my Bible but various photos, cards, and papers I didn’t want to lose and habitually placed temporarily within its pages were not harmed. The dictionary appeared with minor water damage. The Encyclopedia of Illustration was more seriously water damaged but I am trying to restore it. The bowling pin lamp turned up in the basement and now graces the end table by the sofa in the house we are now renting. The little wooden box was burnt up almost beyond recognition but the contents inside, including the old algebra test, were still intact. The chickens would need to be moved today so I had made sure to close the doors to their shelter the night before so I could do it first thing in the morning. I would need to warm the engine block on the diesel tractor in order to start it, so I plugged in the engine block heater and went inside for breakfast. I would need to give the tractor some time to warm up so I killed some time after breakfast making some phone calls and studying a supply catalog I had picked up yesterday at a soils management workshop. Around 10:00 I fired up the tractor and went out to move the chickens. 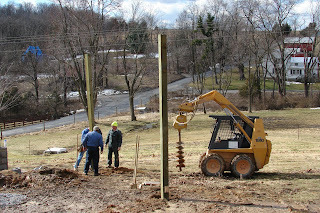 This involved taking down the electronet fence surrounding the shelter, pulling the shelter with the tractor to a fresh location in the field, reassembling the fence, and moving feeders and waterers to the new location. Normally this task takes about 15-20 minutes. This morning it took me at least forty five minutes as it was difficult to push the fence stakes into the still partially frozen ground. As I was working I noticed a small wisp of smoke in front of the hoop house. There is a 50 gallon drum sitting there which Christine often uses to burn kitchen trash. The smoke appeared to be coming from the barrel so I was not alarmed. I finished the job and came back in on the tractor. Normally I would have parked the tractor at its usual spot between the fuel tank at the northern edge of the woodshed and a small Ford tractor parked about 15 feet away. This morning I parked it behind the hoop house as I intended to carry fresh feed and water to the chickens, and then go back out on the tractor to feed hay to the cattle. The wind had picked up a lot in the previous half hour and was blowing hard from the west. As I walked around the back of the hoop house and turned the corner towards the woodshed I suddenly found myself looking with horror at a good sized fire at the base of the wood pile blowing into the pile with the force and intensity of a gigantic blowtorch! The next scene will be etched forever in my mind. I briefly shifted my gaze from the house fully engaged in fire to see Bert’s prized eight months pregnant mare lying dead in front of her barn, guts spilt out on the ground, and a trail of blood leading across the yard from the fence line and sharpened post where she had apparently disemboweled herself in her panicked flight to escape the dense billowing cloud hurtling through their pasture paddock and towards the horse barn. I would later learn that Bert had seen the stricken horse shortly after she had gotten out of her car and, realizing that there was nothing she could do for the horse, came on up to help us get the plants moved to the redbud bush on the far side of the yard. Minutes later a piece of flaming roof debris landed on the ground beside the greenhouse, buckling the bows with the heat and cooking the remaining flats of plants inside. By now the fire trucks were arriving and we had to move all of our cars farther up the road to make room for them. By now the community news grapevine was abuzz. Ric’s wife Joy was on the phone calling family and church friends. Craig Good, son in law to my eldest daughter Celia, was the first to arrive and help the firemen to hook up fire hoses. Celia called second daughter Rhonda and gave us the word that she and Kerwin would get here tonight. My son Hans called from Berea Kentucky that he would be here before morning. One of my brothers heard the call on his emergency scanner, came to the scene, and began calling out to my extended family on his cell phone. Joy brought a bowl of vegetable soup which I could hardly eat. Bert returned from burying her dead horse to assure us that we would have a place to sleep at her house tonight. Several other neighbors from farther down the road, some of whom I had never met, came by to offer help. One called Craig to tell us that he had an unoccupied house about a mile from us that we could rent. Several hours later the fire was under control and firemen gave us permission to carefully enter the now gutted structure and to begin recovering a few salvageable items. One fireman handed me my soaked but otherwise undamaged wallet which he had found somewhere in the rubble. They had gotten most of the fire out before it had had time to settle into the basement so we would be able to recover some furniture, clothing, and greenhouse supplies from that area. Now the mop up phase of the operation was underway as the firemen sprayed fire retardant foam all over the burned area. As the late afternoon daylight began to wane we crept through the ankle deep foam, which lay over the charred debris like a ghostly shroud, and gazed into the familiar rooms to view the vestiges of what had been our personal possessions. Out in the garage and shop area laid the sagging hulks of the market van, a car, the four wheeler, and a riding lawn mower. Several freezers and refrigerators, the wood furnace, and a diesel fuel tank teetered like mottled blackish-gray tombstones covered with snow. The Ford tractor sat at a crazy angle just outside the perimeter of the enshrouded area with the tires burned off the rims on the side nearest the fire. It was a truly surreal scene! One of my first cousins, Raleigh Rhodes, drove up and suggested that we find a hammer and nails and some scrap wood, to temporarily fasten down the hoop house plastic now flapping in the wind. As we worked in the deepening twilight the topic came up. “What happened to the cat and her half grown kitten?” We both agreed that since we had not heard or seen them around, that they had most likely perished. “Meow”. Was it my imagination? “Meow” No, it can’t be! “Meow” Yes, maybe it can be! “Meow” Yes, no doubt about it! But where is it coming from? Over in the calf hutch! I ran over and peered into the darkness amidst boxes, empty milk crates, and rolls of used drip tape. “Meooow” I reached with my hand like a blind man, groping with my fingers into the darkness, feeling beside and under a pallet until I touched a bundle of rough damp fur. I gently lifted it out. The little fellow had most of its hair singed off and he pulled his front feet up and down painfully under his quivering body. “Meooow!” My first thought was that Bert had a compassion for animals and would gladly nurture it back to health. But Raleigh insisted that his 12 year old daughter would be eager to do it also. I sent Smokey with him. We have just gotten back from eating supper at Craig and Celias. I still did not feel like eating much and felt it wise not to push myself to eat. I am exhausted and feel myself at the point of collapse. Running all day on adrenaline has been a new experience and it is causing strange sensations in my body and mind. We are at Bert’s now and trying to sleep. Sleep will not come! The emotional fires that have been searing my guts all day are still smoldering deep within. If someone were to offer me a shot of valium or whisky at this moment I would almost take it. But it is much better that I don’t have this crutch to lean on. I just need to rest and heal. I try to visualize Jesus standing by the bed with his warm hand on my burning stomach and chest. Oh God! Can you reach down and touch me with some healing balm? Finally I drift into a few hours of fitful sleep.